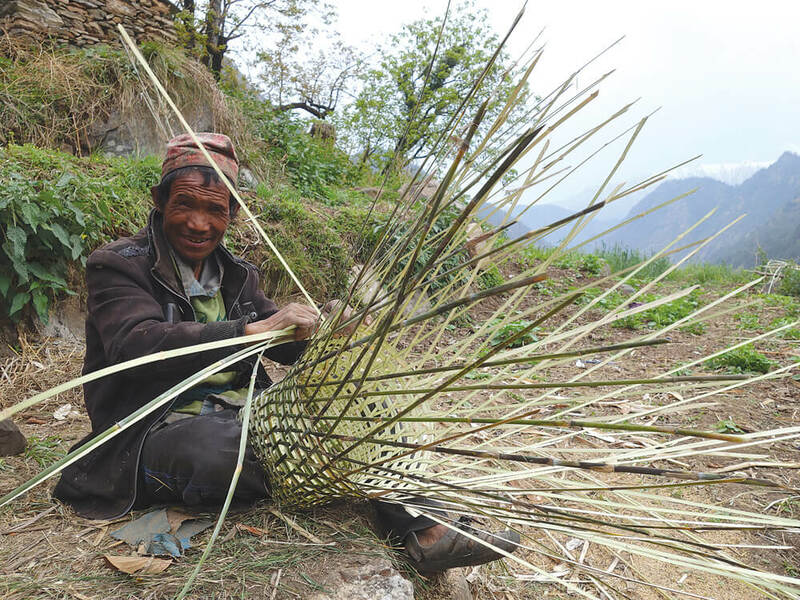 A villager in Maspur, Humla weaves a doko basket from strips of bamboo. “Jai grihasthi” is a greeting heard often in the Far West and Karnali regions of Nepal, and is a way to wish each other success in life, livelihood, household and family. 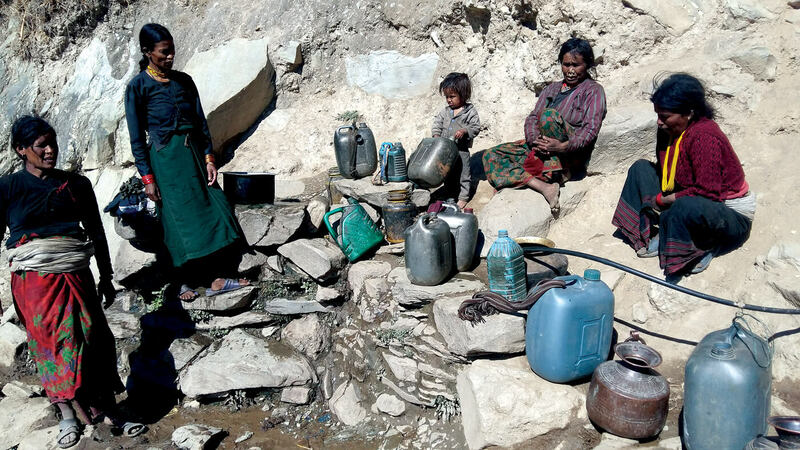 Here in Maspur village above Kawadi Khola, on the border between Humla and Bajura districts, a strenuous two-day walk from the nearest road, it is a daily struggle for people to meet basic needs. 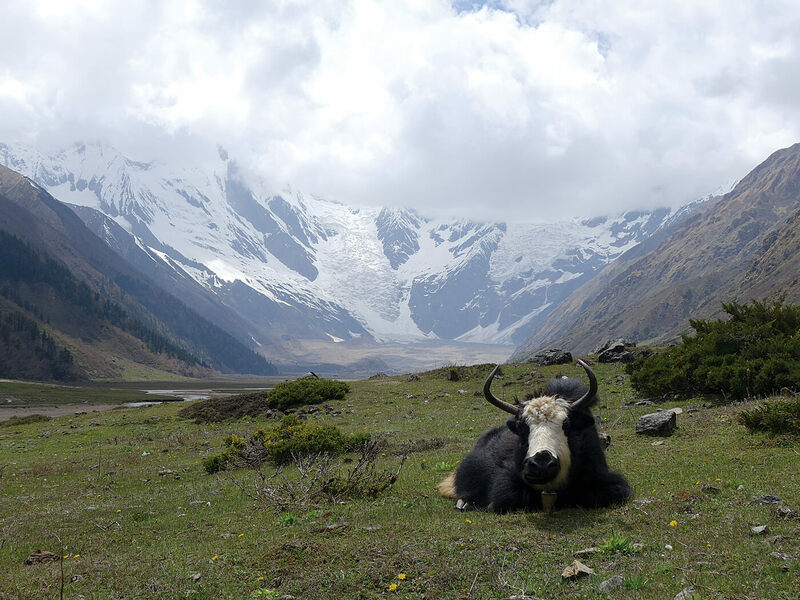 Historically, people here flourished as traders, using goats and sheep as pack animals to carry grain from the plains up to Tibet, and bartering it for salt on the plateau. But the region now suffers from food insecurity, health problems, and lack of livelihood options. The reasons include the end of the Tibet trade, the emergence of roads and markets, a decrease in livestock numbers caused by new grazing restrictions, the destruction of local infrastructure during the Maoist insurgency, and an increase in population. 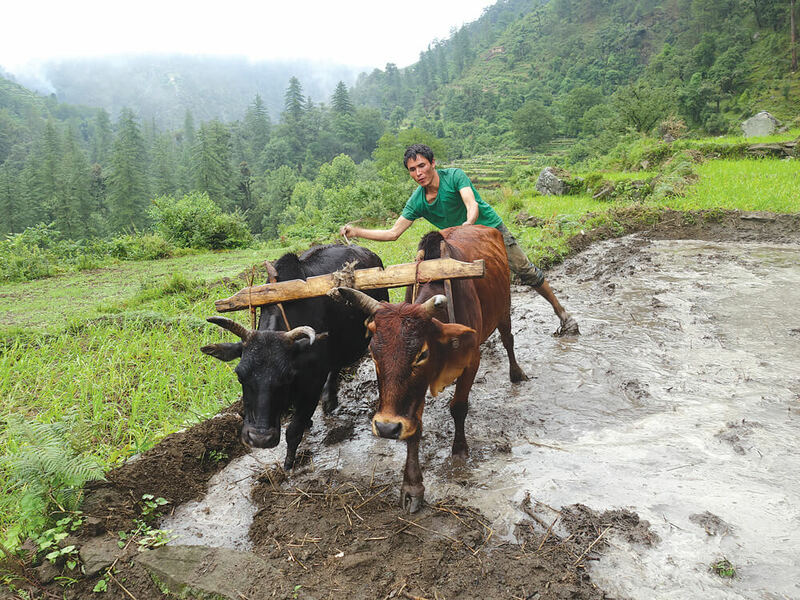 During the monsoon, herders bring livestock to these stunning meadows below Mt Saipal. Maspur village is made up of only 18 households. Oxen ploughing paddy field, there is little irrigation here. Most now farm for a living, but agricultural yields are low because of the steep terrain, lack of irrigation, destruction of crops by pests, and antiquated technology. Most families can grow enough food to last only four or five months of the year. For the remaining, they must purchase or borrow food. But cash is scarce, so people rely heavily on subsidised food and loans. The nearest health post is a two-day walk away, time that farmers cannot afford, particularly during the busy harvest seasons. Tuberculosis and gastrointestinal illnesses are pervasive and exacerbate the symptoms of malnutrition. Many homes do not have toilets, and hygiene is poor. Women and the ‘lower’ castes are especially disadvantaged. Women have limited mobility and control over household resources, and Dalits have very little land or education, and suffer discrimination. “I do not even know if we are Nepali citizens … we Dalits are neglected and oppressed. We have little property, nobody looks after us, not the government, not the organisations, not the gods,” says Romalal Lwaar. Iswarlal and Lachhi Budha dream that their daughter will one day go to America to study. 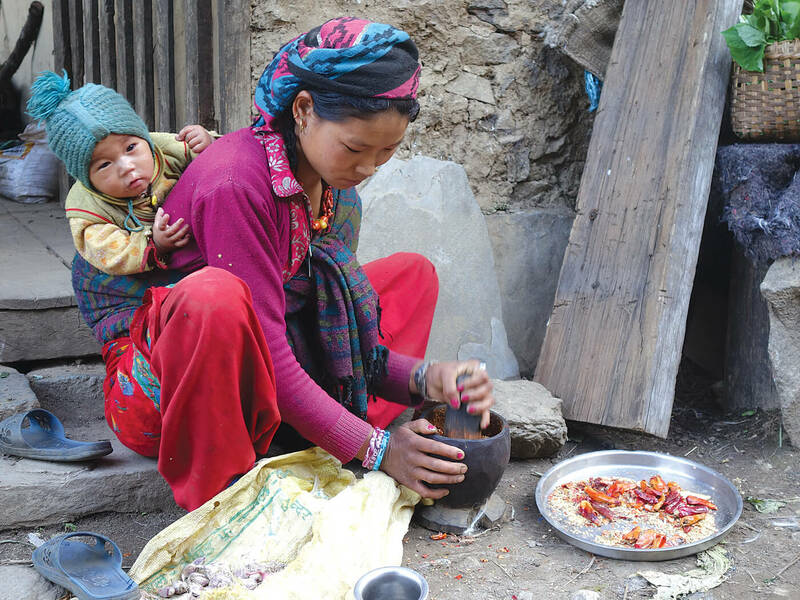 A Lama woman from Gumba of Bajura prepares a chili paste for cooking. Everyone’s priority here is more roads so farmers have access to services and markets. Roads will also make it easier for government and NGO staff to be more effective. As roads and markets become more accessible, communities here need to add value to their products so they are marketable. Some possibilities include cultivation and processing of medicinal and aromatic plants and high-value mushrooms or herbs, production of wool handicrafts, cheese, honey, and sustainable harvesting and processing of forest products. These activities need minimal external inputs, and can be achieved through skills trainings, mentorship, and micro-grants. 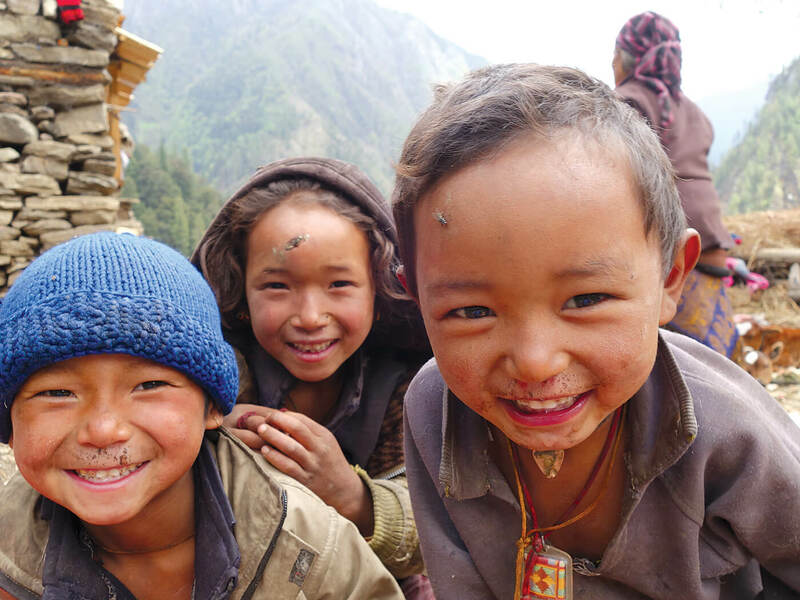 Despite hardships, children in Chyachaur of Humla are full of smiles. 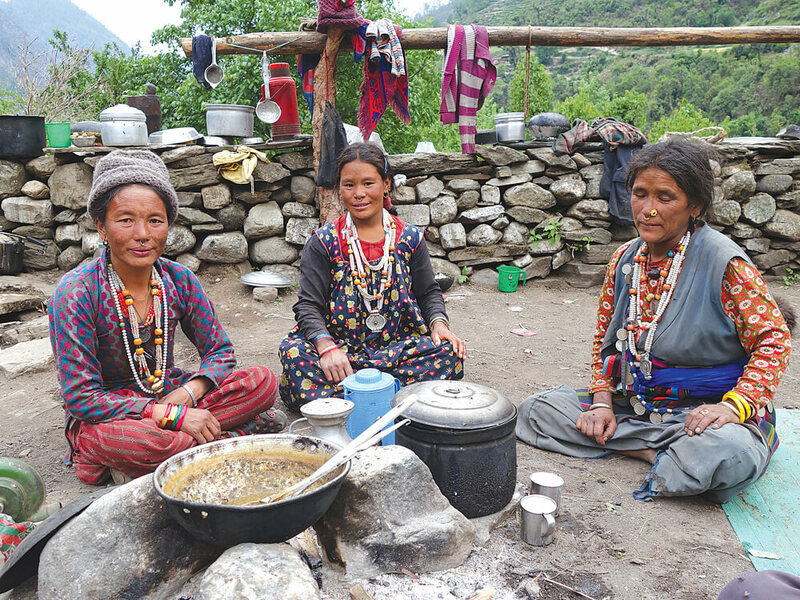 Lama women from Baudi of Bajura take a break from work to drink homemade chhang. 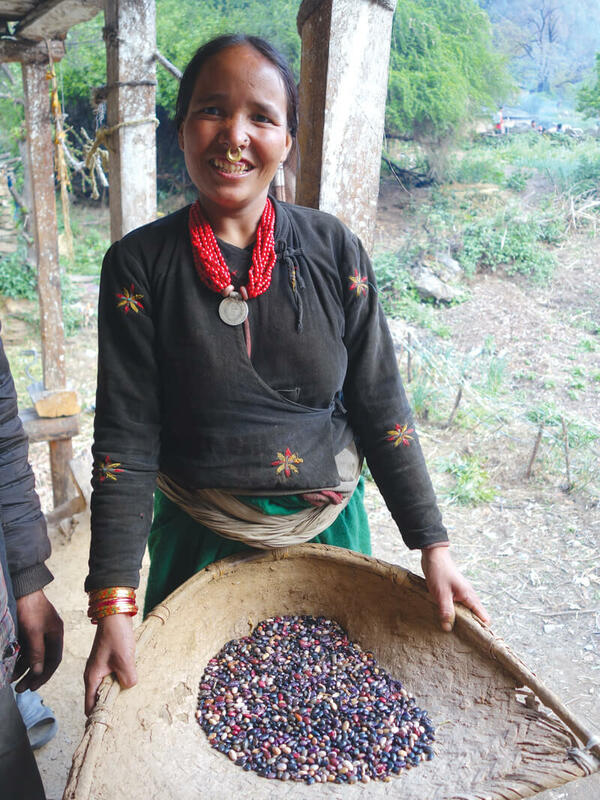 Upari Budha from Maspur displays her bean harvest for the year. Subsistence farmers need help to improve work efficiency and reduce the labour burden. 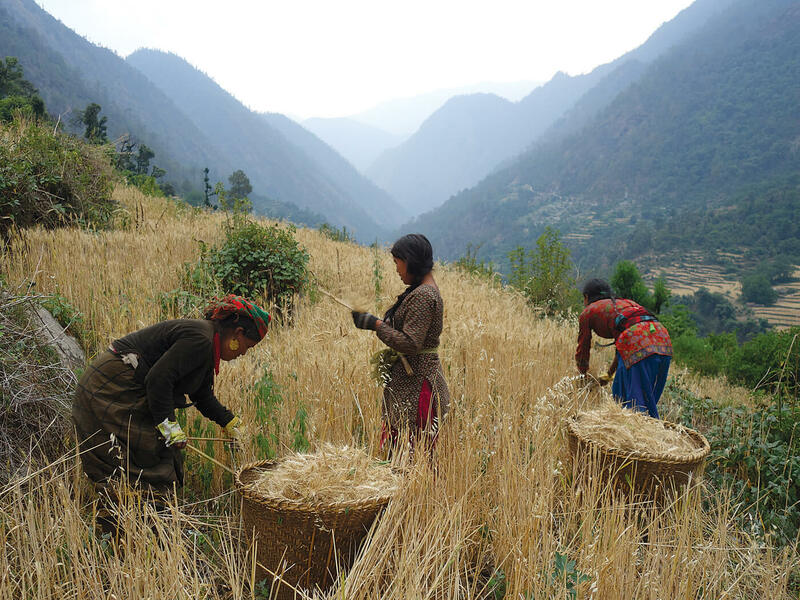 Harvests can be increased with irrigation, bio-pesticides recharging-the-mountains-, greenhouses, and community seed banks. Improved technology such as better water mills, electricity, reliable mobile network, and fuel-efficient stoves will make work easier. There is an urgent need for better health care and education. 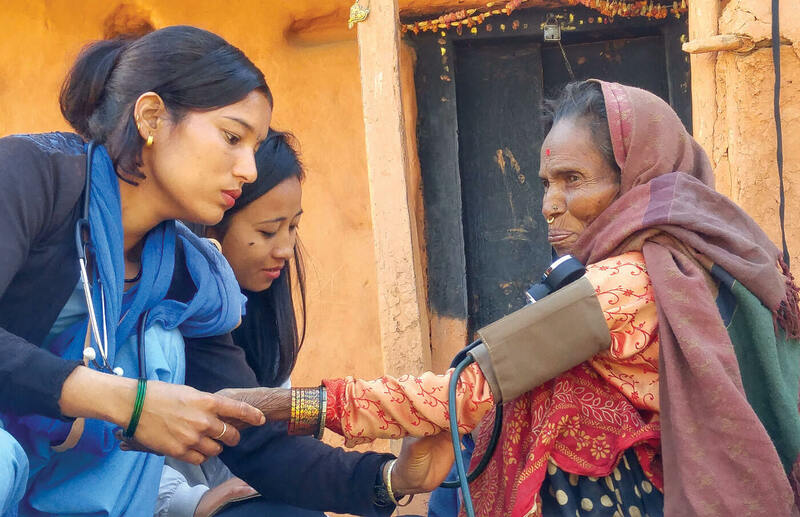 Existing health posts need maintenance and medicines, and additional health posts are required in remote areas. Hygiene education and encouraging women to use health services for deliveries and check-ups are also important. Women and members of ‘lower’ castes must be prioritised in these activities and in accessing technologies, micro-loans, and other resources. Currently, service delivery and other development activities are sporadic and ad-hoc. Sufficient resources must be allocated to allow for long-term, consistent engagement with the community. Outcomes should be regularly monitored and evaluated for lasting improvements. 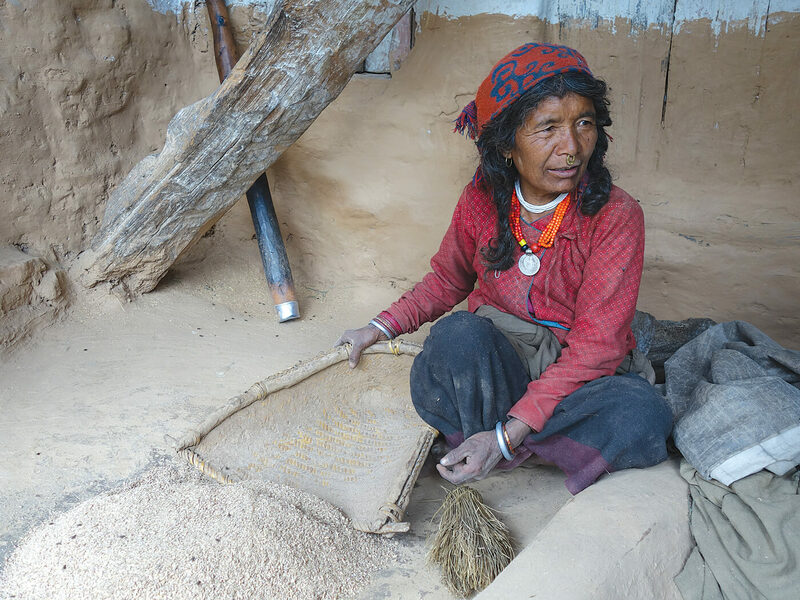 Shubalal Budha pounds and winnows rice by hand in Yuna village of Bajura. 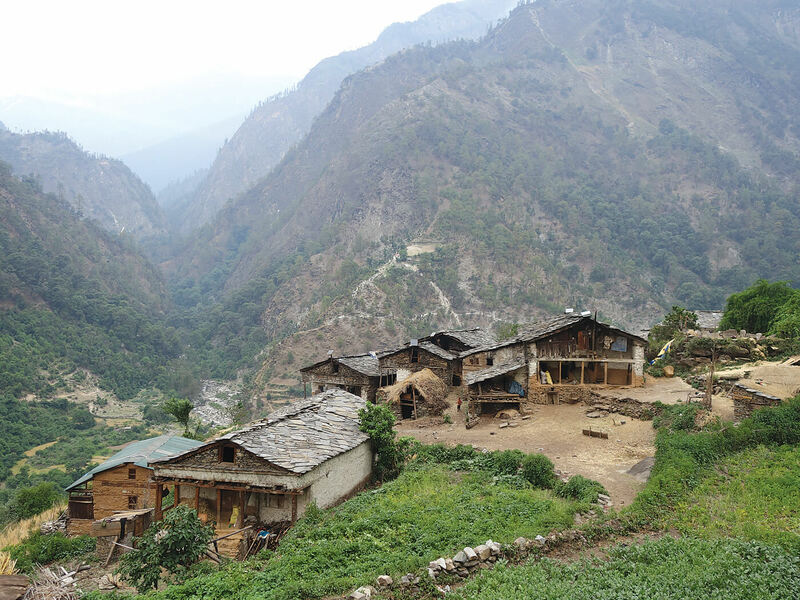 As Nepal urbanises, fewer and fewer people in the rest of the country understand the struggles in places like Maspur village. 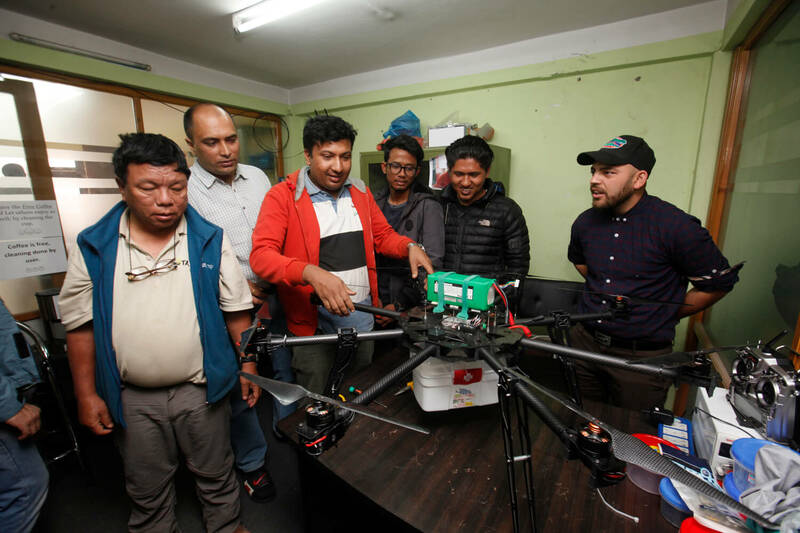 The first step to rectifying this is education and awareness of the living conditions of rural Nepalis and the acknowledgement that they, too, have the right to a secure and healthy life. It is only when the needs and hopes of Nepalis who have been historically and systematically disempowered are properly incorporated into national policies and development plans that we can wish the people in places like the Kawadi Khola valley ‘Jai grihasti’.